My bike has 53/39T chainrings and a cassette with 12,13,14,15,17,19,21,23,25 sprockets, but I like to ride up steep mountain roads. Is it possible (without great expense) to replace two sprockets to make it a little easier to spin instead of mash? My rear derailleur is a Shimano RD-6500. I tried checking online, but I couldn't find a clear description of what the maximum sprocket size it supports is. Would it be practical to replace, say, the 23T sprocket with a 24T and the 25T with a 27T? Or is there something else I should be considering to make the gearing a little more friendly for spinning on steep roads? No, you will need to get a whole new cassette, the largest 3 rings are connected to each other, you cannot just purchase individual cogs. You may want to get a new chain as you will probably need to make a chain length change with jumping from a 25T to 27T or 28T largest cog. Do you know if you have the SS or the GS? With the SS (short cage) you can go as big as 28T, Shimano sells a 12-28 cassette. With the GS (long cage) you can go as big as 27T, look for a 12-27 cassette. Another option for easier spinning is a new compact crankset, Shimano comes as a 34/50, but you give up high end speed. Added screenshot of the relevant tech info for the RD-6500. Hope it's helpful. Although the derailleur has the capacity for 28t as an SS derailleur, Shimano never produced a 9 speed 28t cog. 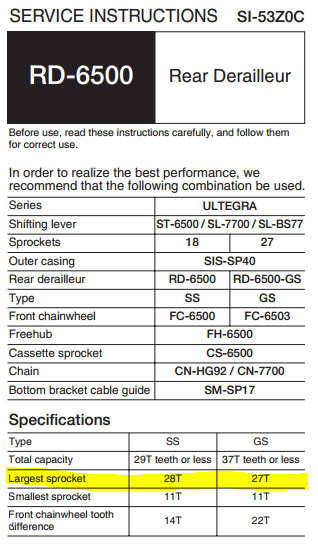 Therefore, as a practical matter, the 27t is the largest option available for the RD-6500 Ultegra 9 speed derailleur from Shimano. There are cassettes available from Interloc Racing Design which fill this missed niche. You can buy individual cassette sprockets! You don't need to buy a whole new cassette. I don't know where you are, but SJS Cycles in the UK stock individual Shimano sprockets, and Rose Bikes in Germany do too. Another route is to use a Marchisio sprocket. These can be made up in any combination of ratios you like. Again, you'll need to do a bit of Googling to find a stockist, but you will be able to order individual sprockets or a cassette in any combination of ratios you like. They are Shimano and Campag compatible. It's also worth looking at SRAM, Miche, BBB and other compatible cassettes if you can't find exactly the ratio you want in Shimano or Campag. Not the answer you're looking for? Browse other questions tagged road-bike gears derailleur cassette or ask your own question. Are Ultegra 10 Speed Sprockets available separately? Should I replace these cassette and chainring?